A lot of bloggers have problems choosing their preferred blogging niche, this however is not that bad. Have been there. You will learn how to discover your blogging niche perfectly in this article. Lets head on and begin..
A blogging niche defines exactly what relative contents is published on your blog; Just like having a professional job as a medical doctor then you can decide if you are a dentist or a surgeon. Because of much simplicity, what really are these niches you might consider?! Discovering a blogging niche is a crucial phase in blogging because it determines what category your blog falls in and the idea you build your blog around. Though I have seen bloggers make huge mistakes when picking a niche so you should avoid such mistakes. If you need to learn how to discover your blogging niche then you should consider yourself and your main purpose of blogging from the start; What exactly do I mean? I mean, You should know why you are a blogger. Why do I want to blog? You must answer this, before you go ahead because that is what will keep you going. 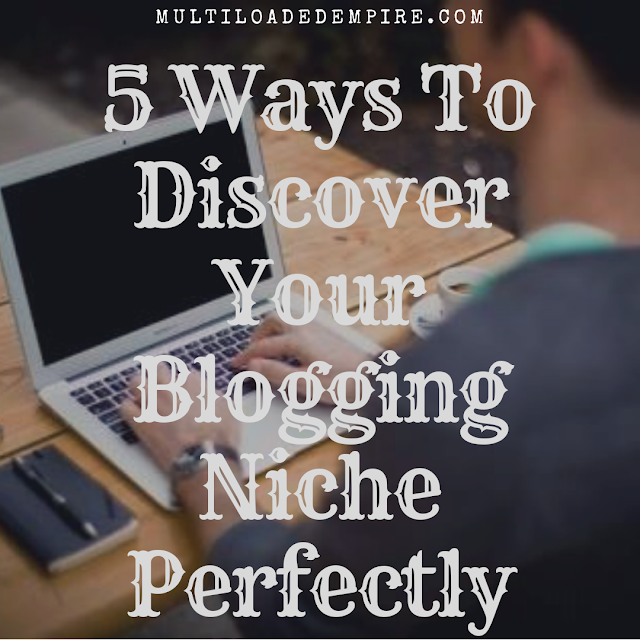 So let’s get talking on this 5 unique ways to discover your blogging niche! Knowing and blogging your hobby is the very major factor that will guide you to know your blogging niche. If I am a business man and my hobby is probably calculating all major wall street’s daily earns and loss; I will therefore make a blog to that shows daily statistics of wall street, that happens because of my interest. If I tend to love soccer, I will go along and make a soccer blog where my friends can catchup all soccer actions. Your hobby is what people know you for and they will easily believe you if you write on that aspect. Are you a lawyer or a teacher? Probably you are a hairstylist! Well I have good news, publish your profession as a content online! Believe me or not, why not try to arrange a blog where your students usually get their after classes lessons; or a blog dedicated to your legal aides or where your clients can get latest hair trends and much more. Moreover, instead of walking straight to your office, patients can look up your health advice from your blog. Yea! You know; This proves to even flow blogging along with your daily job and keeps things going extra-efficient. Also, this idea tends to promote your business as well. Your blog’s niche sure determines your blog’s outcome (success and failure). That is what makes this phase essential, you probably might have opted-in to start a health blog or an educative blog based on your profession; with this then, your question could be “ what next? “. The proper thing to do next is research your competitors, know which blog ranks well in health niche, which dominates in business, who can you take out faster in entertainment niche. Though, I do advise some niches might have strong competitors but as long as you are blogging for passion just try to get daily 2000 viewers and you are good to go. Just write great content that serves your readers and make them want to come for more. Is your niche worth it? Can it be said that your niche can serve your interest and at same time earn you good amount of money as reward for your efforts?! If yes, then you have 110% percent backing from me to go ahead. Create a good profitable niche idea that can raise your blog’s popularity and earnings when you apply right efforts. Understand your niche properly; know how well you can keep yourself comfortable in it financially, although, most times money is not the central attraction; Understanding the value of your niche is necessary. You have now understood how to discover your blogging niche. The proper action now is to get started. Create a blog and apply your niche in it, get involved, write good articles in your niche, reach out to you audience and Get people to read your blog easily. Over time you will learn it is nice you have a good niche in store, though, you might not start getting the quick success, just apply good strategies and improve your marketing. You are armed with great information to easily discover your blogging niche. My advise to you is start a blog today (download my ebook for beginners to get started), apply efforts to it and watch your niche convert flexibly. It is my good intention you succeed in whatever niche you decide to tackle, just keep yourself motivated and always going. I can provide further assistance, quickly scroll down learn more on how I can be hired. Some of my services are free.